As you may have noticed, 2013 has seen the pioneering Cologne imprint Kompakt notch up its 20th year in the notoriously trend-led and fickle techno business. To celebrate this feat the label are setting up a pop-up store here in Berlin this Saturday with the local support of Electronic Beats (hi!) and one of music’s most important technology companies, Ableton. This means that between August 31st and 7th September, between 2pm and 8pm (but closed on Sundays), Berliners will be able to trade their hard earned for exclusive records and merchandise marking the milestone year. But we’ve already told you about that. What we haven’t reported is the week-long program of activities that are being laid on to accompany it. 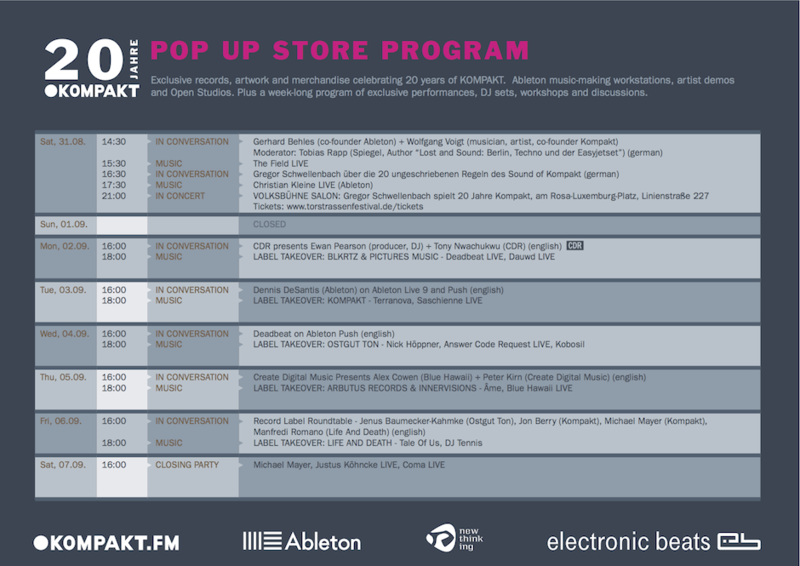 Taking place in Ableton’s showroom in Prenzlauer Berg (Schönhauser Allee 6-7, 10119 Berlin), they’ll be the opportunity to take part in discussions with key producers and industry figureheads, get hands-on in digital music workshops and watch in-store performances. 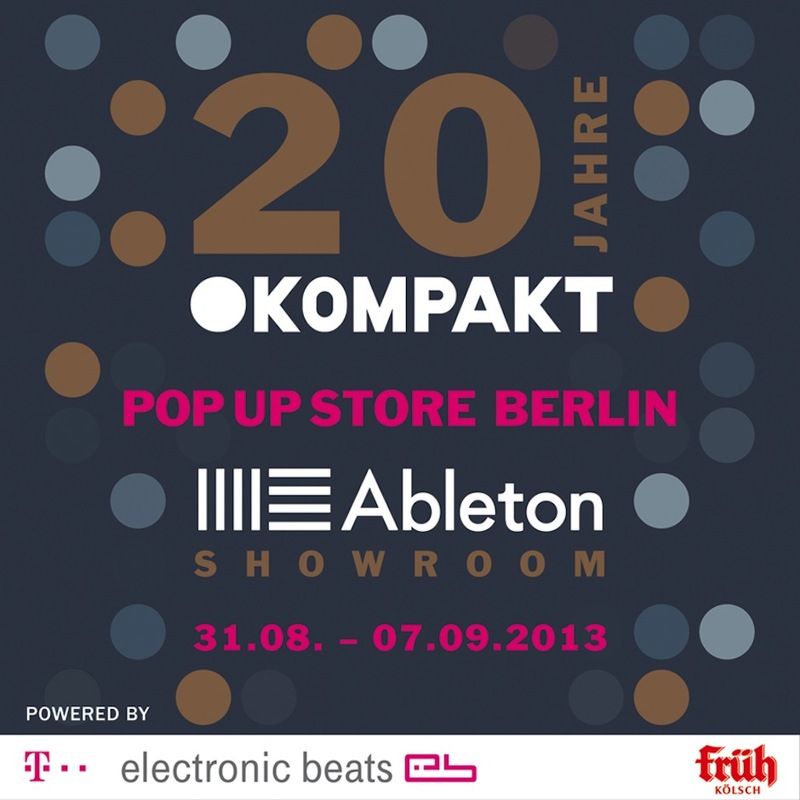 Highlights include a live in-store performance by The Field, a discussion between Ableton’s co-founder Gerhard Behles and Kompakt co-founder Wolfgang Voigt and, of course, the 20 Years Of Kompakt party at Berghain/Panorama Bar which brings the project to a close on Saturday, September 7th. The line-up for that is stellar, with live performances by Justus Köhncke, John Tejada and Kölsch, plus DJ sets by Michael Mayer, Tobias Thomas, Blond:ish, Rebolledo, Stocksaur DJ Team and Dave DK. The full program is below. For more information, check Kompakt’s Facebook event page. What’s more, it’s a Kompakt Special on Electronic Beats On Air on Thursday. Lining up to discuss the cultural import of the label (and play some of the hits) are Kompakt founder Wolfgang Voigt, Sascha Funke, Julienne Dessange (introducing their new project Saschienne), Terranova, Ableton artist manager Olaf Bohn and Electronic Beats’ Editor-in-Chief Max Dax. Tune into FluxFM this Thursday at 10pm CET.